Mark is currently a full-time Registered Nurse at St. Joseph’s Health Centre, Toronto and the first de Souza Intern in Ontario, receiving this designation in May 2018. As a nursing student, Mark recognized the large number of cancer patients, many of whom also require palliative care, in his final year of nursing education and began taking specialized oncology and palliative care courses through the de Souza Institute to enhance his preparation in the field. These courses ultimately assisted in his hire at St. Joseph’s Health Centre, Toronto in his first role as a newly graduated Registered Nurse. Mark graduated from the Ryerson, Centennial, George Brown Collaborative Nursing Program in June 2017 with his BScN. 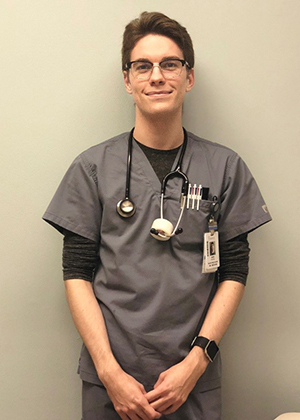 He hopes to pursue his Master’s, write the national specialty certification exam with the CNA in hospice-palliative care, and attain the de Souza Nurse designation in the near future. Mark aspires to become a nursing educator and leader in hospice-palliative care nursing.